The Dream On Me Casco is a beautiful 4-in-1 mini crib with an attached changing table. 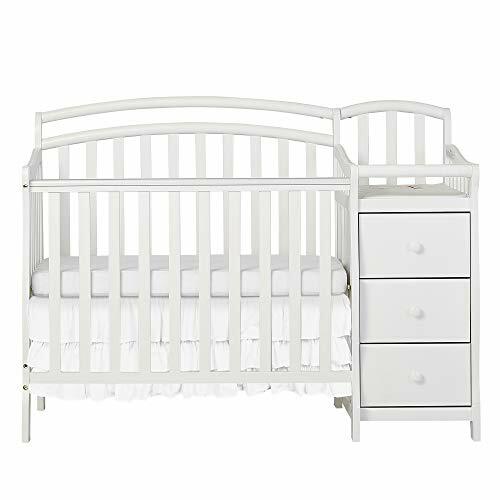 This crib combo is great for smaller spaces. 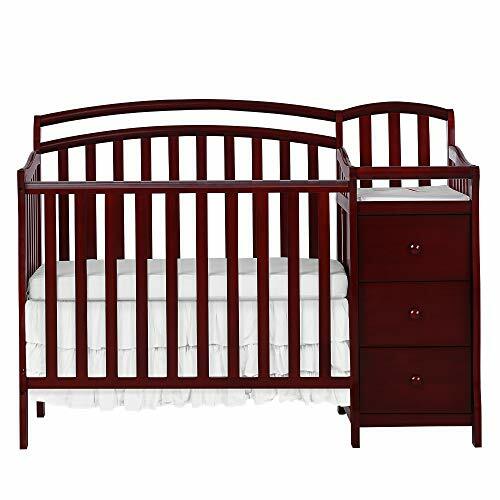 The crib features a three level mattress support and beautiful non-toxic finish. The changing table offers 3 roomy drawers for all your changing needs and 1'' changing pad with security strap for added safety. The crib transitions from crib to a day bed to twin size bed. Twin size bed rails and conversion post sold separately. The crib meets and exceeds all CPSC applicable standards. Accommodates Dream on Me 3 portable crib mattresses( sold separately). All tools for assembly included. ECR4Kids Stackable Rest Cot is the perfect place for your children to take a nap. Whether at school, in a daycare or at home, the nap cot is great for rest time and inter-stacks to save space. Each cot features powder coated steel poles, sturdy plastic ends and a stretch-resistant fabric that fits tightly to the corner with minimal gaps. Fabric attaches with loop and lock closure at both ends. Easy to clean, washable fabric. 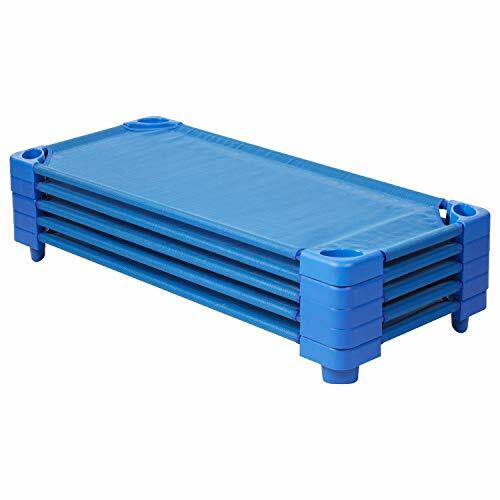 Pack of five cots arrive fully assembled and measures 5" H x 52" W x 23" D, 7 lbs. Recommended for use by ages 3 to 6 years old. These Bedrails allow you to get more use out of your Creations Baby Convertible Cribs. The Bedrail quickly and easily converts the crib into a full-size bed, allowing use of the crib's headboard and footboard. Converting to a "big kid's bed" with a bed that your toddler is already familiar with will give that extra security when transitioning. Made from 100% solid wood - NOT plywood or Veneers like other rails! 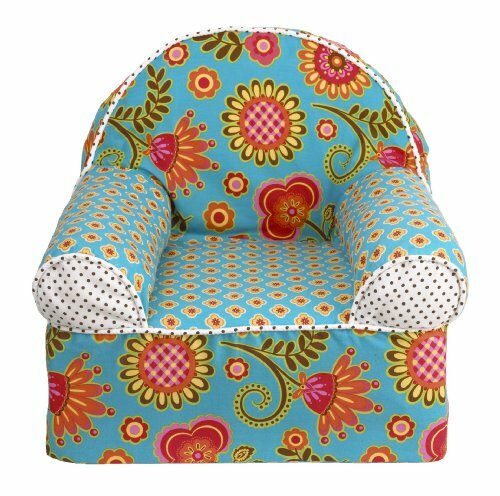 Gypsy Baby's 1st Chair is a light weight foam chair covered in bright, fun fabrics. The chairs are coordinated to match crib bedding from the Cotton Tale line. These little chairs are great fun for baby and a special addition for the nursery, measuring 16 x 18 x 17. Cotton cover has a zipper and is machine washable in cold water, delicate cycle. Hang to dry. Perfect for your little girl. 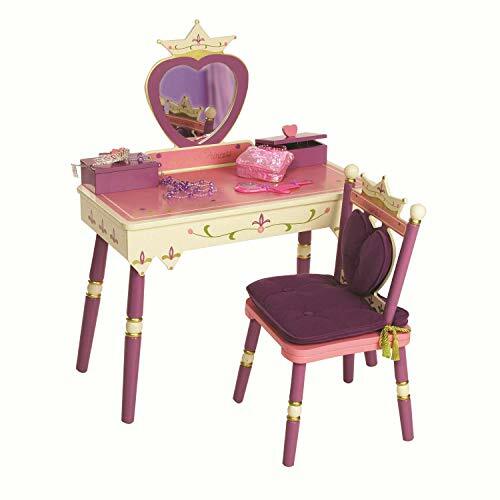 Wildkin s Princess Vanity Table & Chair Set is the perfect playroom addition for the little princess in your life! Each set includes one vanity table measuring 37 x 15.5 x 32 inches, and one chair measuring 26.3 x 13.5 x 15 inches. The Princess Vanity Table & Chair Set is full of special touches that your own royal highness will love. Each chair comes with a removable seat cushion and heart-shaped back cushion in a rich, royal purple with gold tassel accents. The back of the vanity is inscribed with a special message Always a Princess that will make your little one feel simply aristocratic. Wildkin s Princess Vanity Table & Chair Set combines bold, colorful designs with practical features for a play room accessory that s both fun and functional. Your little one will love gazing into the heart-shaped mirror and stashing trinkets inside the heart-topped jewelry boxes. Lift the top of one of the two jewelry boxes to expose a secret music box that plays Pomp and Circumstance once opened. Each Princess Vanity Set was created with your child s safety and stability in mind. Made of a super strong, durable MDF and solid wood blend, you won t have to worry about your vanity malfunctioning. Just follow the included assembly instructions and your little one will be on their way to a magnificent experience. Each Princess Vanity Table & Chair Set was designed to coordinate with other Wildkin d cor. From bedding, bench seats, to rocking chairs, your child will love seeing their favorite designs pop up throughout the house! Recommended for children ages 3+ with a max weight of 100 lbs. Spot clean only with a non-bleach wipe. Dry cleaning recommended for back and seat cushions. 90-day manufacturer's warranty against defects - normal wear-and-tear, and misuse excluded. Rigorously tested to ensure that all parts are lead-safe, bpa-free, phthalate-free, and conform to all rules and regulations set forth by the Consumer Products Safety Commission. THE PERFECT PLAYROOM ACCESSORY - Wildkin's Princess Vanity Table & Chair Set is the perfect playroom addition for the little princess in your life! Each set includes one vanity table measuring 37 x 15.5 x 32 inches, and one chair measuring 26.3 x 13.5 x 15 inches. Whether your child is playing dress up with friends or admiring their royal reflection, they'll always feel like a queen when seated at their vanity. A VANITY WORTHY OF THE CROWN - The Princess Vanity Table & Chair Set is full of special touches that your own royal highness will love. Each chair comes with a removable seat cushion and heart-shaped back cushion in a rich, royal purple with gold tassel accents. The back of the vanity is inscribed with a special message - Always a Princess - that will make your little one feel simply aristocratic. With Wildkin's Princess Vanity, your child will be sitting comfortably in the lap of luxury in no time! IT'S ALL ABOUT THE FEATURES - Wildkin's Princess Vanity Table & Chair Set combines bold, colorful designs with practical features for a play room accessory that's both fun and functional. Your little one will love gazing into the heart-shaped mirror and stashing trinkets inside the heart-topped jewelry boxes. Lift the top of one of the two jewelry boxes to expose a secret music box that plays Pomp and Circumstance once opened. BUILT TO LAST - Each Princess Vanity Set was created with your child's safety and stability in mind. Made of a super strong, durable MDF and solid wood blend, you won't have to worry about your vanity malfunctioning. Just follow the included assembly instructions and your little one will be on their way to a magnificent experience. COORDINATES WITH OTHER WILDKIN D COR - Make a theme out of it! Each Princess Vanity Table & Chair Set was designed to coordinate with other Wildkin d cor. From bedding, bench seats, to rocking chairs, your child will love seeing their favorite designs pop up throughout the house! Warranty: 90-day manufacturer's warranty against defects - normal wear-and-tear, and misuse excluded. Rigorously tested to ensure that all parts are lead-safe, bpa-free, phthalate-free, and conform to all rules and regulations set forth by the Consumer Products Safety Commission. Children Grow Fast. Fortunately, the Oxford Baby Convertible Cribs can grow with them. 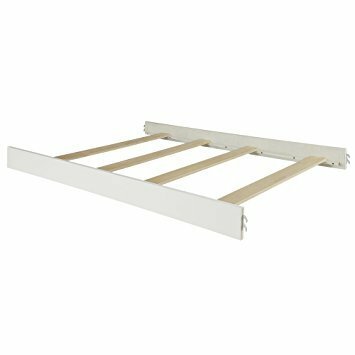 This Conversion Kit in Vintage White easily converts your Cottage Cove crib into a big kid's bed. Using your existing crib headboard and footboard, these rails allow you to turn your crib into a full size bed (also known as a double bed). This allows for an easy transition for growing children without completely changing their atmosphere. You will only need a boxspring (foundation or bunkie board will work also) and a mattress. A favorite nursery piece, DaVinci's classic Autumn Crib is now available in a versatile crib and changer combo that provides everything you need for baby in one convenient package. During the infant years, the changer with included changing pad, provides an extra deep surface for diaper changes with spacious drawers and multiple storage shelves to hold all of baby's necessities. The crib converts four ways from a full size crib to a toddler bed, to a daybed, to a full size bed (mattress, toddler and full size conversion rails sold separately). After converting to a full size bed, the detachable changer can be easily repurposed as a nightstand. Complete the collection with the matching Autumn Bookcase/Hutch and Autumn 4-Drawer Dresser. 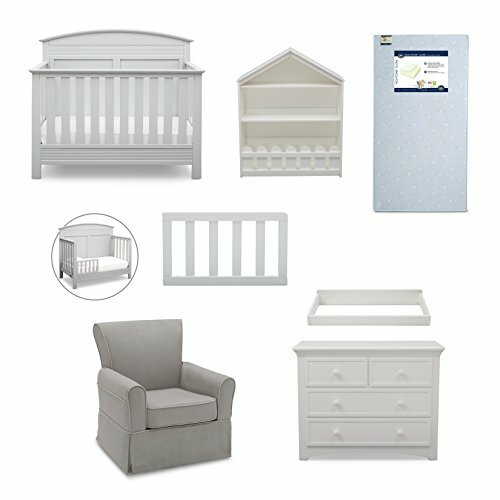 The Serta Barrett 7-Piece Nursery Furniture Set in Bianca White, Dark Chocolate and Grey is built to adapt to all your baby's needs (and look good doing it)! 7-Piece Set: This set includes a Convertible 4-in-1 Crib that grows with your baby through four stages, and is the only sleep space your child will ever need. As a crib, it features four mattresses height positions that allow you to lower it as your child grows. Once your little one is ready to make the transition to a "big kid" bed, it effortlessly converts into a toddler bed, daybed, and lastly, a full size bed (Daybed Rail and Toddler Guardrail included; Full Size Platform Bed Conversion Kit #700850 sold separately). The set also comes with endless storage options, the Happy Home Storage Bookcase to store books and toys, a coordinating 4-Drawer Dresser with safety stops that prevent the drawers from falling out, as well as a Changing Topper that transforms the dresser into a convenient changing station. 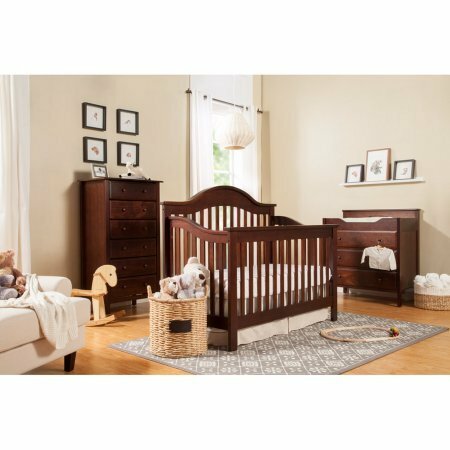 That's not all, this set also includes the Benbridge Nursery Glider Swivel Rocker Chair from Delta Children and the Nightstar Glow Crib and Toddler Mattress from Serta. From the Convertible Crib to the Glider, this versatile baby nursery furniture set is full of stylish pieces you'll want to keep around long after the diaper era. Serta Quality: From the same brand that's been leading the way in mattress innovation and technology for more than 80 years, Serta nursery and kids furniture offers the same quality craftsmanship and attention to detail as their adult mattresses. With a variety of styles from traditional to modern, Serta nursery and kids furniture has a style to fit every child's room. Every piece is designed create an inviting and comfortable space that will nurture the next generation of dreamers. 7-Piece Nursery Furniture Set Includes: FREE Baby Digital Monitor | Convertible 4-in-1 Crib | Toddler Guardrail | Bookcase, 4-Drawer Dresser | Changing Top | Glider and Crib Mattress | Assembled dimensions: Crib: 57.5"L x 30.5"W x 44"H | Toddler Guardrail: 18.5"L x 10.75"W x 0.75"H | Bookcase: 36.5"L x 12.25"W x 45"H | 4-Drawer Dresser: 43.5"L x 18.75"W x 33.5"H | Changing Topper: 36.25"L x 18"?W x 5.5"H; Glider: 30.25"L x 32.50"W x 36.00"H | Mattress: 52" x 27.5" < 6"
Any space in your house can be transformed into a stylish baby nursery with the Serta Ashland 7-Piece Nursery Furniture Set in Bianca White, Dark Chocolate or Grey! The set also comes with endless storage options, the Happy Home Storage Bookcase to store books and toys, a coordinating 4-Drawer Dresser with safety stops that prevent the drawers from falling out, as well as a Changing Topper that transforms the dresser into a convenient changing station. That's not all, this set also includes the Benbridge Nursery Glider Swivel Rocker Chair from Delta Children and the Nightstar Glow Crib and Toddler Mattress from Serta. The versatile items in this set allow you to create a timeless space for your child that they'll love long after they're out of diapers. 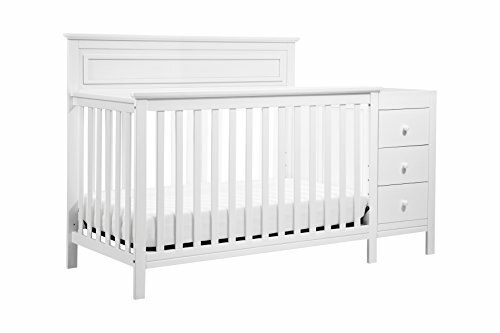 7-Piece Nursery Furniture Set Includes: Convertible 4-in-1 Crib | Toddler Guardrail | Bookcase, 4-Drawer Dresser | Changing Top | Glider and Crib Mattress | Assembled dimensions: Crib: 57.5"L x 30.5"W x 44"H | Toddler Guardrail: 18.5"L x 10.75"W x 0.75"H | Bookcase: 36.5"L x 12.25"W x 45"H | 4-Drawer Dresser: 43.5"L x 18.75"W x 33.5"H | Changing Topper: 36.25"L x 18"?W x 5.5"H; Glider: 30.25"L x 32.50"W x 36.00"H | Mattress: 52" x 27.5" < 6"
Benbridge Nursery Glider Swivel Rocker Chair features: Whisper quiet, gentle glide motion with soothing swivel action | Removable cushion for easy cleaning. DaVinci Baby's Jayden Crib with Toddler Rail Conversion celebrates generations of style. With its elegantly curved back and simple solid slats, Jayden combines traditional appeal with timeless clean lines. 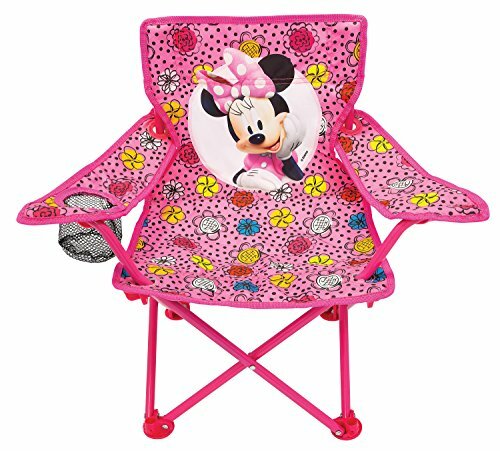 The Minnie Happy To Be Me Fold N' Go Chair has colorful character graphics and is great for indoors or outdoors. Sturdy metal tubular construction. Folds for easy storage & comes with its own carry bag. Each chair has a safety locking mechanism. No assembly required. S 4 8 34 90cm/35.4" 67cm/26.3"
M 6 10 36 96cm/37.8" 68cm/26.7"
L 8 12 38 102cm/40.1" 69cm/27.1"
XL 10 14 40 108cm/42.5" 70cm/27.5"
XXL 12 16 42 114cm/44.8" 71cm/27.9"
Size:S US:4 UK:8 EU:34 Bust:90cm/35.4" Length:67cm/26.3"
Size:M US:6 UK:10 EU:36 Bust:96cm/37.8" Length:68cm/26.7"
Size:L US:8 UK:12 EU:38 Bust:102cm/40.1" Length:69cm/27.1"
Size:XL US:10 UK:14 EU:40 Bust:108cm/42.5" Length:70cm/27.5"
Size:XXL US:12 UK:16 EU:42 Bust:114cm/44.8" Length:71cm/27.9"
High-quality bright colors never fade fashion and youth. TransFold risers are ready to go wherever you perform. 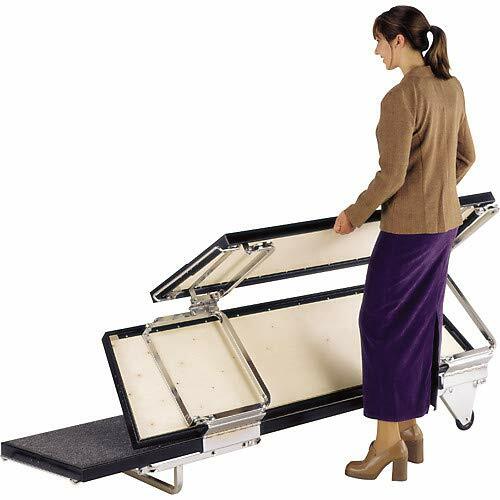 All risers feature built-in wheels, 3/4 inch decks with carpet, tubular steel frame and Midwest's exclusive gas-spring assisted design to open the unit with moderate foot pressure and provides a safe, controlled motion when folding for transportation and storage. Description: Made from wooden density board material, full of industrial style. Unique design, great for home, bar, pub, restaurant, coffee shop, bookstore. Enhance atmosphere:Quick and easy way to dress up your house. Transforms your home style. 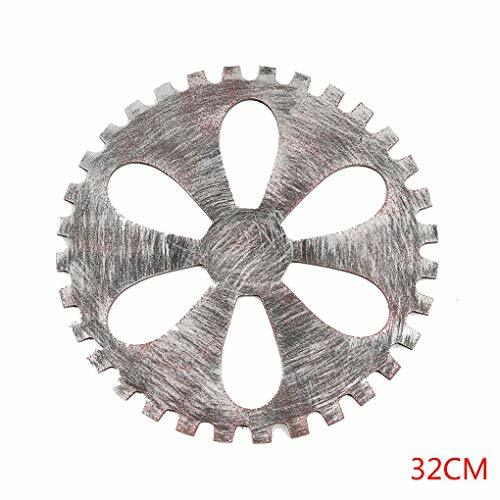 This retro style looks like an industrial gear and is completed on a shabby chic metal surface. Perfect for any occasions gift such as wedding gift,birthday gift, business gift, anniversary gift, etc. Specification: Material: wood density board. Color: show as pictures. Diameter: 14cm/24cm/32cm. Note: There might be a bit color distortions due to different computer resolutions. There might be a slight error due to different hand measurement. Package included: 1 * Wall Hanging Ornament. Package Including .